Exciting whitewater thrills on the Bow River! A half-day whitewater tour that offers adventure lovers rafting thrills and excitement close to Banff, Canmore and Calgary. The Horseshoe Canyon section offers spectacular scenery, big waves and up to Grade IV whitewater. Cliff jumping is also available for the adventure enthusiast! Winding through the picturesque landscape of Kananaskis Country, the Kananaskis River is a great whitewater experience for families or as a group outing. Conveniently located 45 minutes west of Calgary, this river offers the novice rafter a thrilling and fun introduction to whitewater rafting. 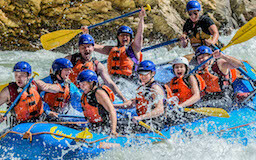 Experience the Rockies' most thrilling whitewater rafting on the Kicking Horse River with 20kms of grade 1-4 rapids just outside of Golden, on the border of Alberta and BC. A BBQ lunch at the riverbase lodge is included. Sit back and relax while the friendly driver shuttles you from Banff or Lake Louise to your exciting whitewater adventure! Morning transportation is available throughout the season, afternoon transport is only available May 17 - June 14 and Sept 3 - Sept 15 2019. If you don't see your hotel on the list, please choose the nearest one or give us a call on 1877-565-9372 for assistance.